Special application areas require special solutions. Accordingly we developed the PEEK-guide strip as special equipment for hydraulic cylinders resisting even enormous lateral or transverse forces. The background: at very demanding applications high pulsating transverse forces often have to be transmitted in small movements. Comprehensive test series proved polyether ether ketone (PEEK) as the ideal material for guide strips. The material is characterized by an above-average combination of strength and tenacity. Also at high operating temperatures it stands out by maximum toughness and good sliding properties combined with a high impact resistance. 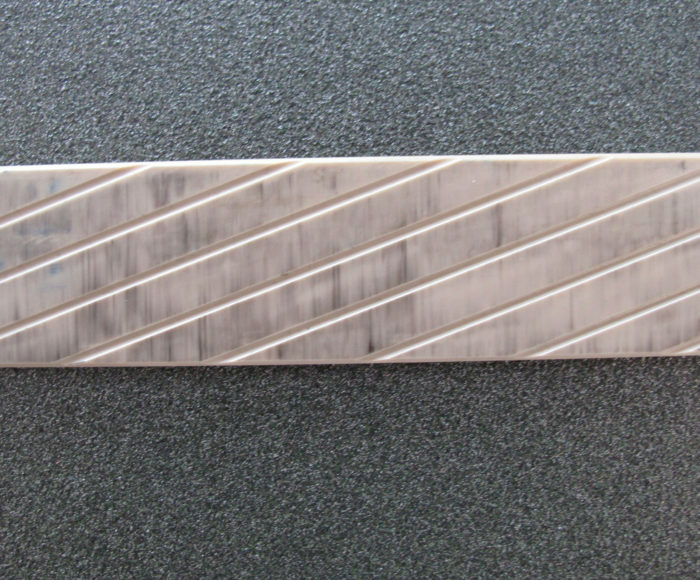 A diagonal groove pattern in the guide strips additionally guarantees the permanent exchange of lubricating film at very small cylinder stroke movements. Hence, deposits are effectively avoided. The application of PEEK strips is of advantage as reliability is significantly increased and maintenance intervals are considerably extended through outstanding service life of the cylinders. We tailor our PEEK-guide strips individually according to the requirement profile of the customer. This way we can flexibly and quickly provide the suitable solution of each application case.